[ARCHIVED THREAD] - We knew it would happen-Arsenal just announced hefty price increase!!! I was just at my dealer's picking up a Colt 9MM carbine-he said Arsenal just increased prices on all of their guns due to the new import ban!!!! That didn't take long!! Glad I got my Classic before now!!! If you guys have been waiting, you waited too long I am afraid!!! Seems like prices have gone up everywhere. I guess supply and demand applies here. My FFL also said Arsenal is shipping a batch of milled underfolders with the stamped stock struts and flash hiders. Actually Bill, this is for a SPECIAL "Limited Edition". . . . . . .Bill-such sarcasm!! Sounds like I need to get another Arsenal ! Templar what do you have in stock?? I feel bad for the guys who have been doing the home builds. The Antis are never satisfied! Well, Arsenal, Inc. has not announced anything... you just heard from your dealer. This may or may not be true. Anyway, I can never understand bellyaching about price increases - supply and demand WORKS. If they price their rifles too high we will stop buying them. I know when I have reached the limit of what I will pay and when I get there I simply wont pay it. The bellyaching comes from the fact that the price increases are due to the artificial constraints put on the market by our dear old friends the atf. Blame our congresscritters and Executive Orders, not the ATF. They are just the enforcement branch. We pay $12,000 for a $500 automatic rifle because of them. In economics this is what they call "whatever the market will bear". So, as long as we are willing to pay what ever the suppliers demand, the prices will continue to go up until the market will no longer bear the increases. The AK market right now reminds me of the stock market in the 1990's when the law of the bigger fool reigned. Katar-I believe my FFL. He is an Arsenal direct dealer. lets agree to blame everyone. the atf, the congress, the pres's. they are all responsible now and have been repeatedly. lets hope the price hike that occurs because of this isn't too big. There will be some increases in pricing on some rifles, they havn't made an official announcement as far as I know and I talked with the prez of Arsenal today. They are working with a finite # of barrels that they can legally build into the M7 series. There are fixes to the barrel situation being looked into, but they aren't going to be cheap ones. We'll just have to see what'll happen in the next few months. 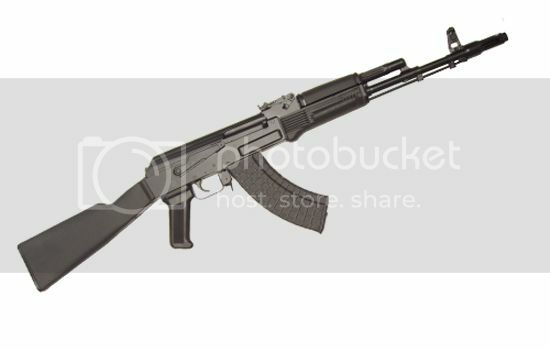 I would like to have an AKS-74 anyone know if Arsenal plans on building these? Arsenal price increases don't bother me too much.. I have allways found their products to be way over priced.. They are nice, but still way too high..
Glad I got mine hehe. I got my SLR-101 for a really good price, can't complain. I'd be willing to pay a little more if its goes towards US made steyr forged chrome lined barrels. I feel fortunate that the Arsenal rifles I want are already out there, or will be imported as a whole. Yep, AKS-74's are still on the list of things to get out to the public. Another48hrs is hitting very, very close to the mark. Too bad the price is going up. Not unexpected, they won't be able to get the less costly factory barrels. Makes sense to sell what you have for as mcuh as the market will bear. Sure, $1200 is a heap of cash for an AK, but the SAM7SF was simply What I Wanted.